Winter at Lake Tahoe and Truckee provides the perfect opportunity for families looking to let loose at one of the coolest outdoor playgrounds in the world. Whether your kids want to spend all their time on the slopes, or none of it, there’s a plethora of family-friendly indoor and outdoor adventures to cure cabin fever for good. 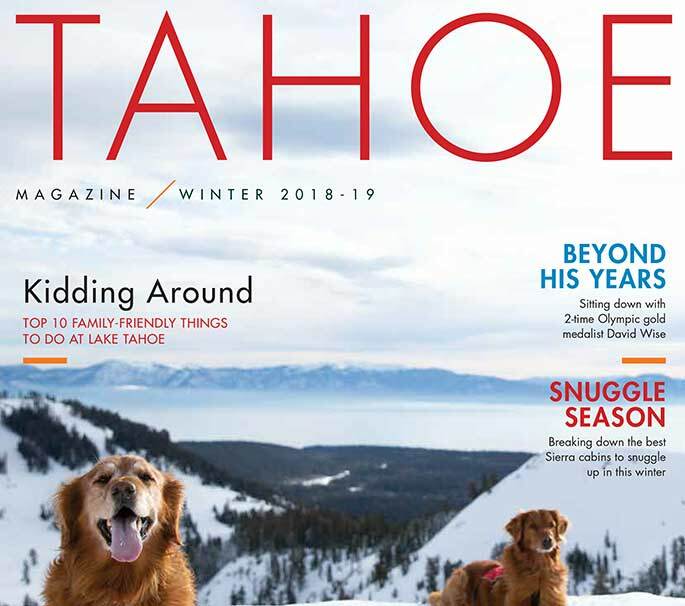 Check out our list below of the top 10 activities — in no particular order — for families to experience during their winter vacation here at Lake Tahoe. Make a splash with your family at the Truckee Community Recreation Center’s heated indoor swimming pool, boasting two water slides, water volleyball and basketball, lap lanes, and a current channel. Or, head over to Incline Village Recreation Center’s eight-lane pool, where parents can attend an aquatics fitness class while kids show off their skills on the diving board. 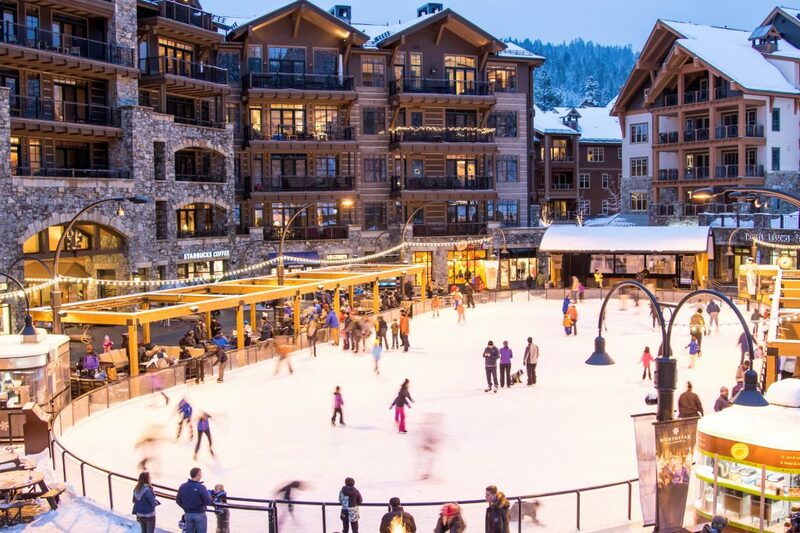 Northstar California’s 9,000-square-foot ice-skating rink is located in the heart of the resort’s Village. Mom and dad can sip on a cocktail and warm up by the fire at one of the surrounding fire pits, while kids take a break from the rink to roast s’mores. Meanwhile, the ice rink at Truckee River Regional Park, located a half-mile south of downtown Truckee, offers public skating, rentals, private lessons and various ice-related activities. 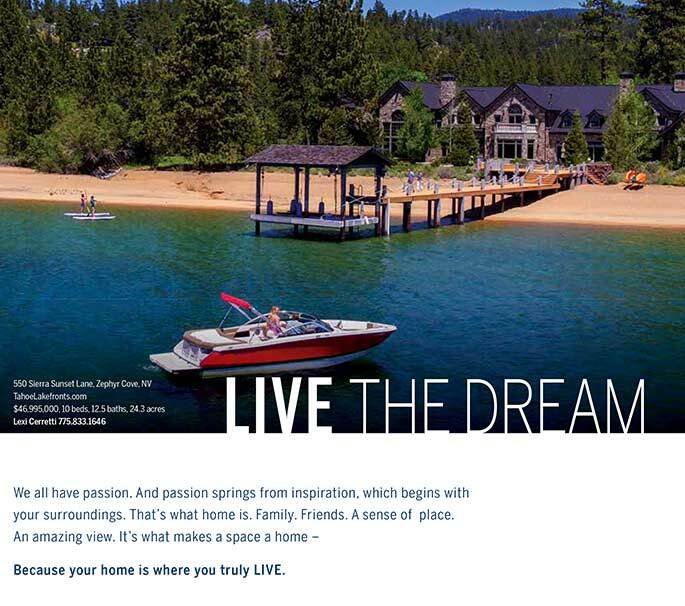 Or, no matter the season, check out the South Lake Tahoe Ice Arena. It’s Tahoe’s only year-round, indoor ice arena, and it offers various lessons and programs. Further, daily public skate sessions are available, including night skate sessions on the weekends; head to www.tahoearena.co for prices and more information. For some indoor thrills sure to keep the kids entertained for hours, check out the Kidzone Museum in Truckee, which features a cushioned crawling area for toddlers, indoor jungle gym, hands-on “doctor’s” office, water play lagoon, toy train stations and more. This season, Northstar is introducing two new Kids Adventure Zones on the mountain, including Skicology and the Wagon Wheel, which provide fun facts and information about the local history and environment of the resort. Or take your kids on an educational trip back in time at the recently renovated Olympic Museum, located at Squaw Valley’s High Camp, where visitors can learn about the 1960 Winter Olympics that took place at Squaw Valley. Admission is free with your Aerial Tram ride fee. 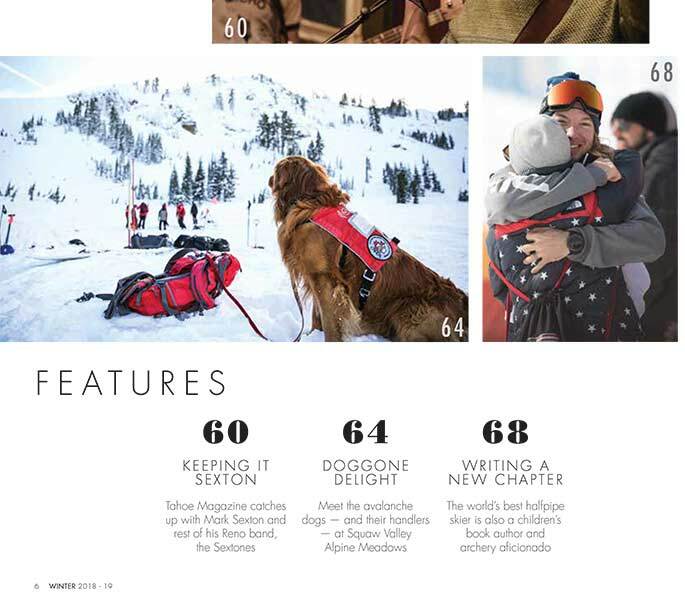 Cozy up with your family and experience the thrilled and excitement of Dog Sledding tours with Wilderness Adventures Dog Sled Tours at Sugar Bowl or at the Resort at Squaw Creek. Thirty minutes south of South Lake Tahoe is the Husky Express Dog Sled Tours, where your family will love the Alaskan and Siberian Huskies pulling the toboggan sleds. Get the kids singing Jingle Bells as you take a ride in an old-fashioned European sleigh pulled by horses. 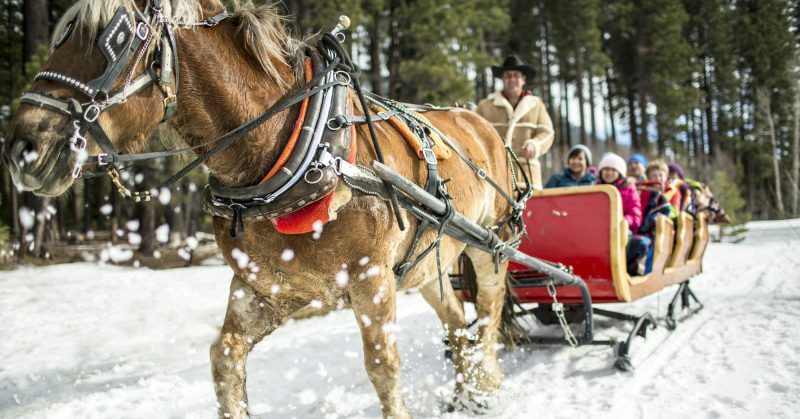 In the South Lake Tahoe area, try family-run Borges Sleigh and Carriage Rides, or take a sunset ride at Squaw Creek Meadows where kids under 2 get to ride for free. For non-skiers who want to experience the scenery and adrenaline that Squaw Valley has to offer, there’s an indoor 30-foot climbing wall, as well as Sky Jump at the base of the tram in the village. Located a short drive from Truckee is Woodward Tahoe’s indoor facility at Boreal Mountain Resort, known as “The Bunker,” which features an indoor skatepark, foam pits, trampolines, a state-of-the-art Digital Media Lab and more. For true adrenaline junkie families, get your young ones on the climbing wall at High Altitude Fitness in Incline Village. Whether your child is a seasoned climber or completely new to the sport, the knowledgeable coaching staff at High Altitude will help find the perfect program for you and your family. Families that like to hike will love snowshoeing. The Mountain Sports Center cross-country ski area at Historic Camp Richardson Resort on the South Shore offers 10 kilometers of marked snowshoe trails leading you and your family to spectacular lake views. Nestled along the Sierra Crest just south of Lake Tahoe is Kirkwood Ski Resort, where your family can enjoy snowshoeing on all 80 kilometers of the cross-country trail system. Several brands and models from basic to expert are available for rent at the resort’s Cross Country Center. Homewood Mountain Resort on the West Shore is the perfect playground for families to spend the day and kids ten and under ski free with a paying adult. Diamond Peak also ranks high as one of Tahoe’s best ski resort for families, with free tickets for kids age 6 and under, interchangeable parent tickets, slope-side parking lots just steps from the lifts, lesson options for kids 3+, uncrowded slopes, beginner terrain park features, and an unrivaled view that is sure to take everyone’s breath away. Tahoe Donner’s Snowplay tubing hill is a fun way to enjoy the slopes without the fear of falling down. At Snowplay, there’s fun to be had on and off the tubing hill with snowman-building contests, snow-bowling competitions, night tubing, snowball-launching challenges and other family events. 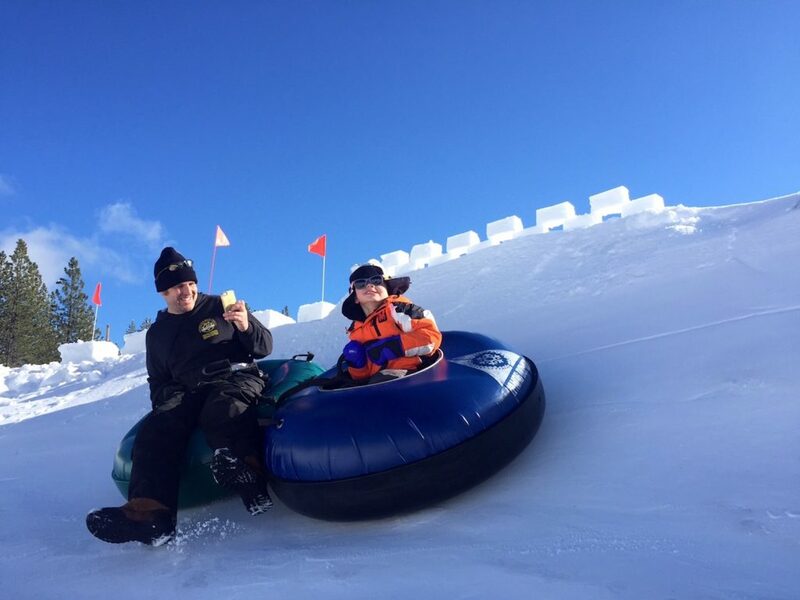 Granlibakken’s sled hill in Tahoe City is the perfect playground for kids of all ages, and best of all, kids under the age of 3 sled for free. Hansen’s Snow Tube and Saucer Hill takes the cake with its giant 400-foot tubing hill, which is groomed daily. The Village Cinemas movie theater in the Village at Northstar offers comfortable seating, a full-service concession stand and two screens, plus a variety of restaurant options nearby for dinner-and-a-movie night. On Lake Tahoe’s South Shore, take in a flick at Heavenly Village Cinema, boasting an 8-Plex with unbelievable sound and picture quality. Plus, there’s an endless supply of real butter popcorn. Don’t forget to validated your parking pass at the Heavenly Village Parking Garage with the purchase of a movie ticket. For a more intimate night at the movies, check out Tahoe/Truckee’s only cinema draft house and independent theater — The Tahoe Art Haus & Cinema in Tahoe City’s Cobblestone Center. Enjoy a premium beer or locally brewed kombucha while sitting in the recently remodeled theater’s rocking chair leather seats or comfortable couches.